Why Your Emails Get Blocked or Filtered? It often happens that legitimate emails are being blocked or moved to the Junk folder by ISPs. Whatever the problem of the email blocking is, you can easily manage it and adjust your email program to overcome the ISP email blocking. You need to understand why ISPs block some emails and how to avoid the problems. Then only you can improve your email deliverability and increase your email open rate. Email spamming is any email that was not requested by a user but was sent to that user. Email Flood: The email is sent to large groups of people. Unsolicited: The email is not requested by the recipients. 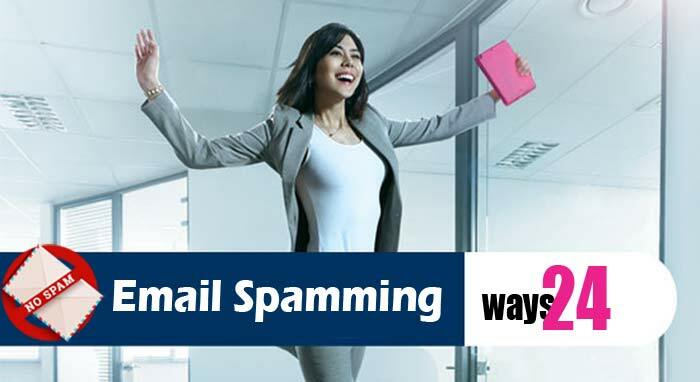 I’m writing this article to stop the email spamming and I’m going to tell you the various reasons so that you can avoid the email spamming easily. Hope this article will help you to keep your email in the inbox only. To avoid Email spamming, here you have to look some reasons, why email goes into junk box. If subscribers are getting information that they did not request, that we called as spam emails. Sending information regarding related products or content can fall under this category. If someone signs up to your site to get computer tips/tricks, then sending special offers for phones probably isn’t a good idea. If someone request for one of product on ShopClues, then they should not get sent offers for another product. Solution: If you are sure about the content then only send it otherwise send only to the requested subscriber list only and ask them what they actually want to receive so that you can prevent your legitimate email going to junk folder. When subscribers don’t confirm your email then they will not be added to your email list. There is also a maximum risk that subscribers aren’t as interested about the information being sent and directly that mail goes to the junk box. Solution: When a user signs up for a particular website, then send a double email to opt into the reader and if reader confirms then only send emails to that reader otherwise don’t send, this will stop junk email list. To prevent from spam emails many times receiver uses filter function.In which reader sets some conditions and doesn’t allow the email to reach in the inbox. You can see in the following example how reader set the filter. Mostly reader avoids emails those coming from an email address like info, no-reply, promo and instead of going in inbox reader set condition so that mail goes directly in spam or delete the email. So, to avoid your email going to the spam box sender must take precautions like don’t use such words like info, noreply, promo in your email address. When people subscribe to your mail they have some expectations from you if those expectations are not fulfilled then subscriber mark mail as spam. Sending too many emails to the subscriber lead to irritation that results into spam mail. People may forget you if you send less no. of emails. Solution: Send valuable emails to the subscriber and avoid irrelevant emails that are not requested by the subscriber and periodically ask for feedback to the subscriber so that this will clear your idea about which email to be sent to the reader. For example: If subscriber subscribed to your blogs then send only emails to blog related only. Emails going to junk folder if subscribers can’t find unsubscribe link because of blank space between the end of the contents and it became harder for a subscriber who wants to leave then they mark the email as spam and that result into spam email. How to overcome this problem? To avoid spam in email, make sure that your unsubscribe link is clear and invisible form. You can also add unsubscribe link in the header so that there is no way a user can miss it and in this way you can avoid spam email. You should always take care of the subscriber’s request and accordingly, you should send emails. There should be consistency while sending mail. If you send too many emails then the user will get annoyed and will result in spam complaints. Sometimes also happen that we send too little email to the subscriber that may result into subscribers forget why they’re getting these emails. To prevent email from going to junk in Gmail we should think about the expectations of the subscriber. Mention in the expectations that how often they should expect to get emails by this we can stop junk email delivery. You should be consistent while sending emails so that you can easily prevent email from going into junk. If you don’t have your own traffic, then this can produce a fictitious result that leads to email spamming.If you want to avoid spam emails then avoid purchased traffic. Because these readers are not naturally coming at your site as they aren’t interested in you. Maybe subscribers can forget, who you are?And for what they sign up by the time they get an email from the sender in their inbox. What to do with this? You can avoid email spamming issues by maximum use of social media to spread the business in the world so that people come to know about your business due to which automatically you can bring your own traffic so that you can avoid emails going to junk instead of inbox. If you have multiple websites and your fans and subscribers following you on one of the websites for your product then make sure that from which email address you are sending and the domain which you are using should be recognizable to the subscriber to avoid spamming prevent email from going into junk. If you are sending email from unrecognized email address then it will create confusion to the recipients and he will put your email directly into the spam box. As a best practice, to stop junk email use recognized email address in from the field so that your subscribers remember you. Don’t change your brand frequently so that subscriber won’t get confused. Example: If you made your email look like it was from SBI bank then the content of the email should relate with SBI bank only. 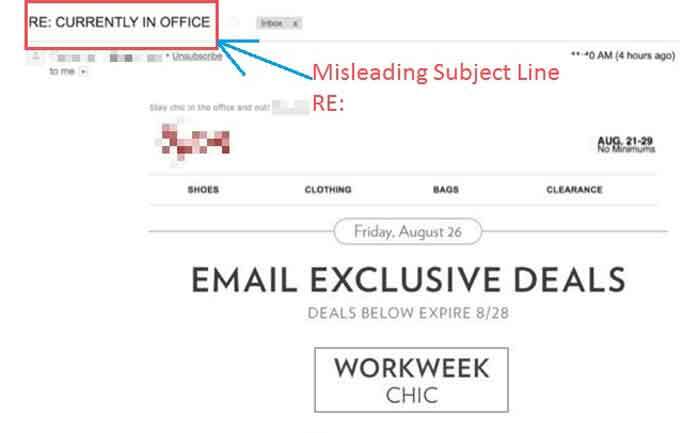 The sender uses them is leading subject line in order to induce the reader to view the email. Many senders stated that they have felt cheated, tricked while opening a promotional email by that email’s subject line. Your account is locked please contact the nearest bank –but actually, there is no issue like this. Thanks for your order! – no order or transaction has actually taken place. “You’re Reservation Confirmation” but there is no reservation like this. So, if you want to stop your emails from going to the recipient’s spam folder then don’t use “Re:” in front of the subject to track subscribers. Don’t use anything irrelevant in the subject line to prevent emails going to junk folder. In order to avoid such words, email provider can have a built in email spam filter checker or sender use email spam check software that checks your emails for spam trigger words before sending it to the receiver. The sender should restrict on using these spam trigger words to stop email spamming. So, use the email spam filter software and avoid the spam email. If email address used by the sender is not valid or it’s fake in such case reader is unable to reply with any questions or with any doubts.This leads to complaints and receiver gets frustrating. To avoid junk email it’s better to give a valid email address. Ask them for feedback so that you can prevent your mail going into the junk box. Hope so above solutions will definitely useful for you to avoid junk email. Writing long emails doesn’t mean you are getting more work done. It’s painful for everyone to read the large content of the mail. As it takes too long time to load. The reader gets bored to read such large email and without reading your email subscriber put spam mark to your email. Tips to avoid spam emails: To prevent spam emails keep your email short and sweet. Shorter and tighter your email messages, the better chance that they will be read, understood and acted upon. Email provider adds the only image to the content of the email, but is this really a good idea for you to do? Some important considerations before you upload that large image into your email message. An image that’s too big will take a longer time to load. The file size of your image impacts its loading time, and big images with large file sizes will always take a longer time to fully load. Most of the subscriber block images in emails by default for security reasons. If your subscriber has images blocked in their inboxes, they won’t be able to read your message if it’s all contained in just one image. Your emails will display differently for customers reading on their mobile devices. Smartphone automatically resizes emails to fit on the screen, but any text on a big image would be unreadable at that size. To prevent emails going to spam folder: Use Smaller Images or Thumbnails. Balance Text and Images. While writing email two parts are mandatory. First is HTML version and the second is text format. Some mobile device doesn’t support HTML version in such cases text version is very important. Some email service provider compares the HTML part and the text version to make sure both the parts are the same. If the sender uses a quality Email Service Provider to create and send your emails, then these two versions should be created for you automatically. But API, SMTP, both the versions need to be identically present. So it is always necessary to use qualitative ESP so that it will enhance the chances of email avoid spam box. While writing an email, the sender must add a valid physical address. It can be your current street address or a registered post office box. It’s best to add your company or organization name and postal address to your email template. Because sender must be transparent about your company or organization and the purpose of your email messages. A valid postal address is one way to show recipients that the email is coming from a legitimate source so that reader won’t put your email in the spam folder. If the sender sends both of these from one IP address then your marketing emails cause you deliverability problems, then your transactional emails will also end up in the SPAM box. So to avoid such type of spamming your Email Service Provider offers the ability to separate your Marketing and Transactional mail streams onto separate shared IP environments. Email authentication verifies that an email is actually from you or your business.It protects your brand, identity, and reputation. It’s one of the most important steps you can take to improve your deliverability. Authentication has become a best practice for email senders since spammers have gotten really smart about disguising malicious email. 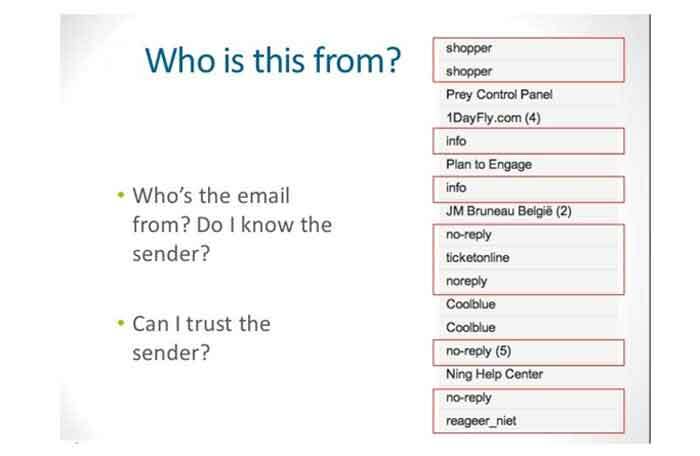 SPF: You’re telling recipients that you’ve authorized Marketer to send emails on your behalf. DMARC: This new technology allows the sender to check whether emails have been properly authenticated by the ISP. From here you can authenticate your sending domain. Every time when the sender sends emails that never reach the inbox. Every time a subscriber reports an email as spam–even if it isn’t really spamming. So why would a reader mark your email as spam even if it isn’t spamming?Well, the most likely reason is that they simply don’t remember you. Even though they gave you permission to email them, they don’t remember doing it, so they think you are sending them spam. 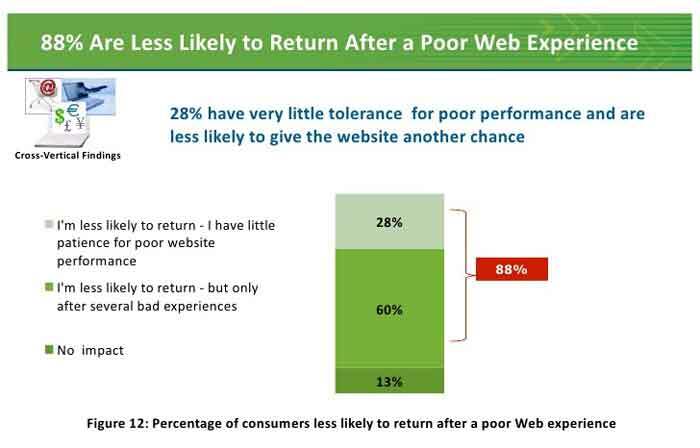 To prevent this from happening, make sure that the branding in your emails is memorable, and matches the branding on your website. This may include color, images etc. 19] Do You Have Low Open Rates? Webmail providers have stated that they look at how many emails are opened by the reader and how many are deleted without being opened as a factor in their spam filtering decisions. So if you have low open rates, your emails are at higher risk of being flagged as spam. Perfect your subject lines in your list, and keep your list fresh. If IP address of email provider is used by someone else for sending spam emails then your emails could get flagged as spam. For example, if you send your email through Mail Chimp, your email is delivered through their servers. So if even one other sender sends spam email, it could affect your deliverability as well. Solution: We should work very honestly to avoid email spamming and don’t allow to anyone to spoof mail. If companies sending a vast number of emails and having a good emailing reputation are granted dedicated IP address then such company have a lot of advantages. But if ESP does not have any idea whether the company is a good mailer or a spammer and if we start sending too many emails the ESP will consider the IP to be a spammer and all the emails sent will land up in the Spam box. To prevent this situation sender should start email sending to the limited no. of recipients and gradually increase it. This will prevent the email to end as a spam. While sending an email to the client, the sender should not send too small emails.If the sender uses just one and a half line of matter with the same subject and sending to the bulk of receiver with the same matter then that mail may go in the spam box. To take prevention from such emails my advice is: Send an email with more than 500 words and if not then add the image to the content of the email. This will definitely prevent email spamming. Sometimes happen that email provider doesn’t know that what the reader really wants and what type of email should be delivered to the reader. This leads to email spamming if the expectations of the reader are not fulfilled properly. So, under must always take precautions about the expectations of the reader and what they are really sending to them. This is also one of the problems in which many senders suffers. They send out too many emails at a time, which also triggers a spam alert. This problem occurs if you’re not using email marketing software that can help organize your campaign distributions. By using Email marketing software you can take the rescue your email campaign from the “junk” folder. Conclusion: Hope so you all will understand these points and definitely these points will help you to prevent from email spamming. 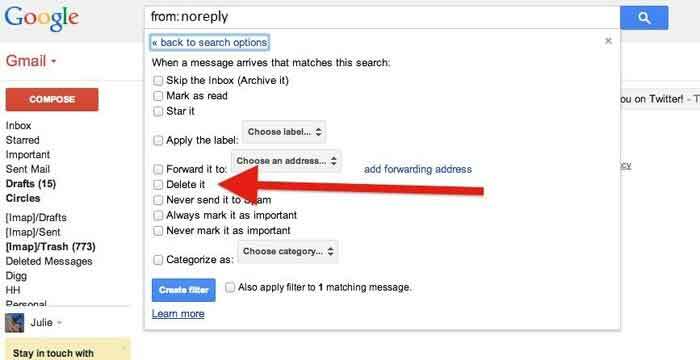 Do let me know which of the above points was helpful to keep your email in inbox instead of junk folder.If you find any queries or any doubts then don’t forget to put your comment. You can read our popular articles just check out here and grow your business. Thanks for sharing the strategies to handle email spam , This is very important because email spamming has increased quite a lot since the last decade. The emails that are not related to our concern should me removed as it misleads the users specially to those who are not use to see and write emails on a regular basis, many hackers and spammers send fake emails to get bank details of the users too. To understand and stop this we need to understand the list thoroughly.